Quick! 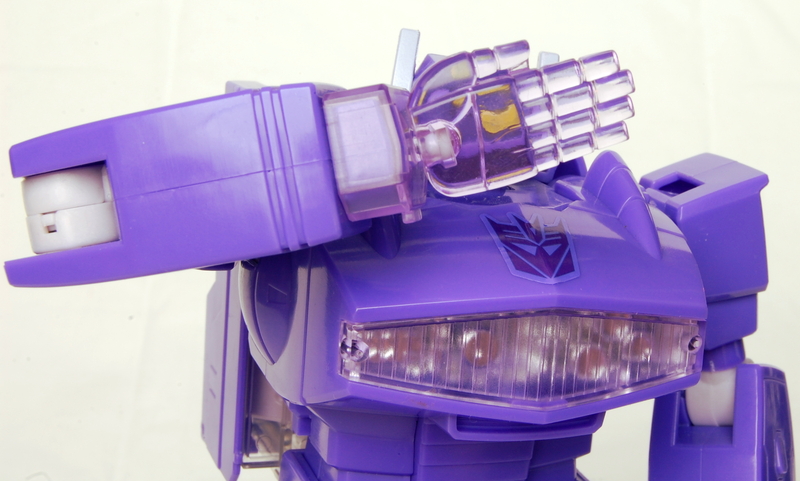 How many hands does G1 Shockwave have? If you answered “as many as he wants, his species has proven to be quite modular”, then you are correct. Don’t believe me? Watch this. When he needs two hands, he has two hands. When he needs a gun for a hand instead, he’s got that. 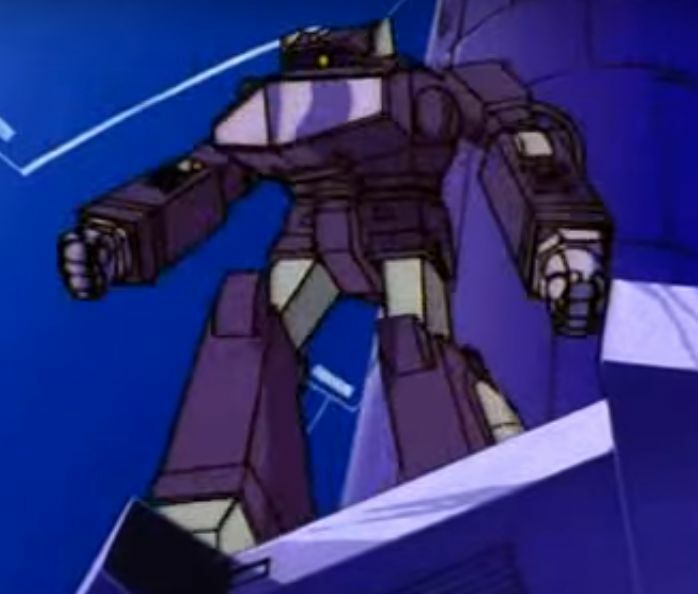 While we’re at it, the gif above points out something else about the Decepticon Military Operations Commander. Let’s dispel another myth: depth perception is rather easily achieved with a single lens. Seriously, Google “single lens depth perception” or just ask Bumblebee how that rather accurate shot to his windshield felt. Although, I do concede that it’s much funnier to imagine that this super-logical, hyper-advanced, scientist robot capable of emitting “lethal beams of energy from anywhere on the electromagnetic spectrum: gamma rays, X-rays, visible light, infrared rays, radio waves, etc.” has problems not walking into walls. This is why he is so good at hide and seek. 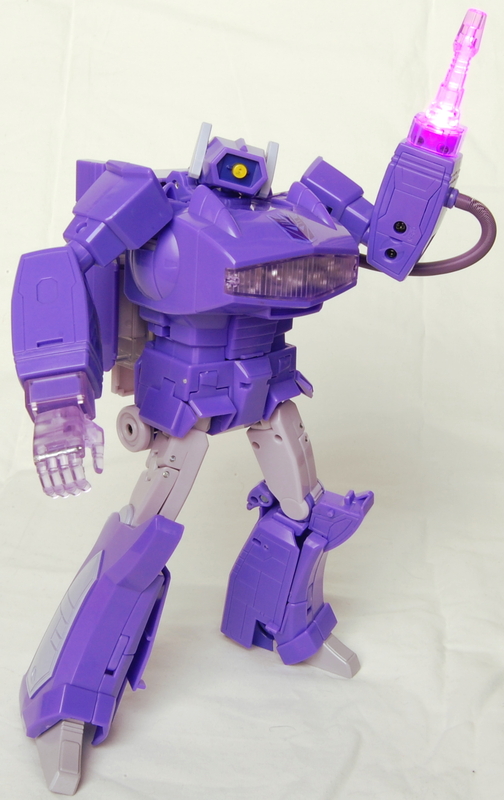 While the translucent versions of his left hands makes sense — that’s where the toy’s light-up feature emanates from — the translucent versions of his right hand are to make him accurate to his G1 toy. He also has regular grasping hands for both sides. 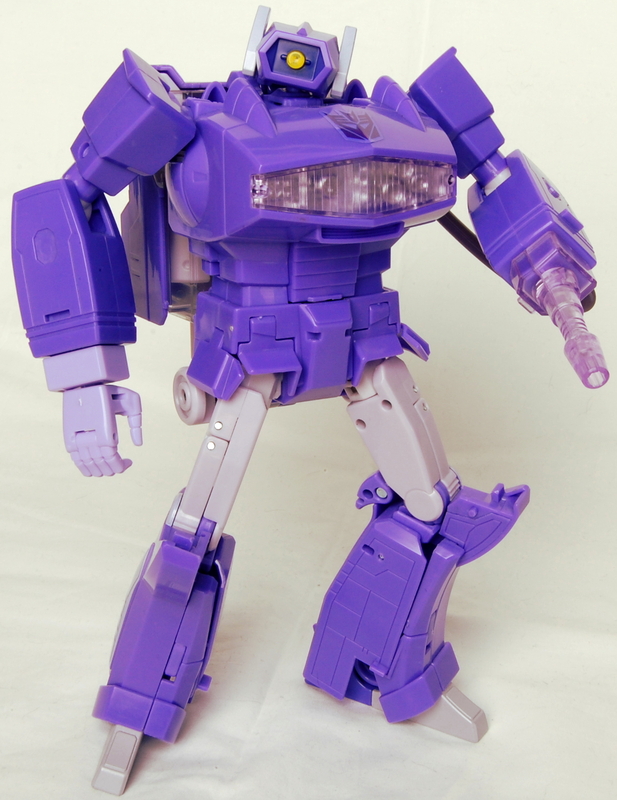 However, to make him most G1 toy accurate he has a translucent right hand to go along with his translucent gun hand. 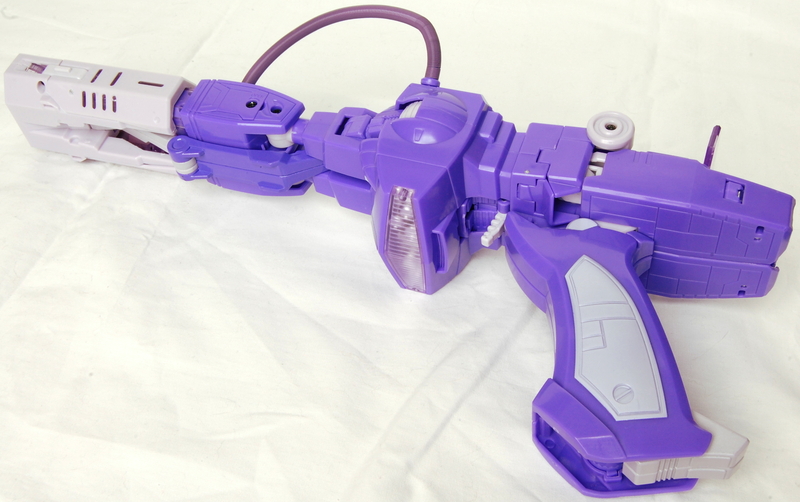 Along with making it more toy accurate, the translucent gun hand helps better demonstrate one half of the toy’s electronic light gimmick. 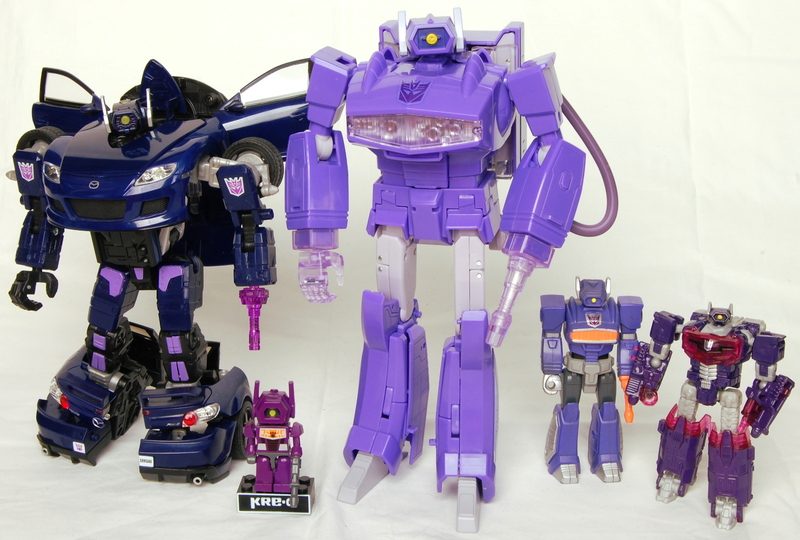 This Masterpiece release really refuses to lay a line down between choosing G1 toy-accurate versus cartoon-accurate. Not only between the multitude of different hands in opaque or translucent plastics, but with the sticker set that comes with him. 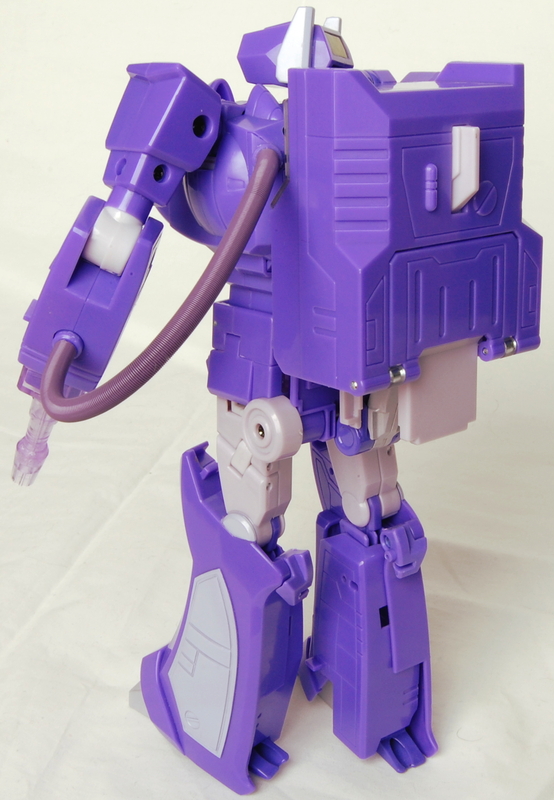 His G1 toy had a single Decepticon symbol on his chest with later releases adding a rub-sign to his left side. 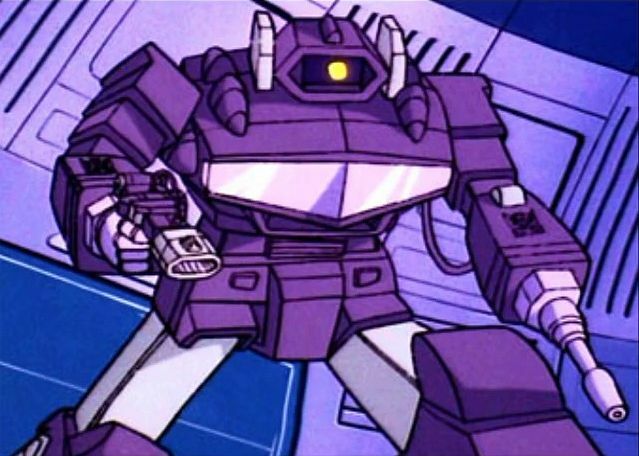 In the G1 cartoon, he had two Decepticon symbols, one on either forearm. 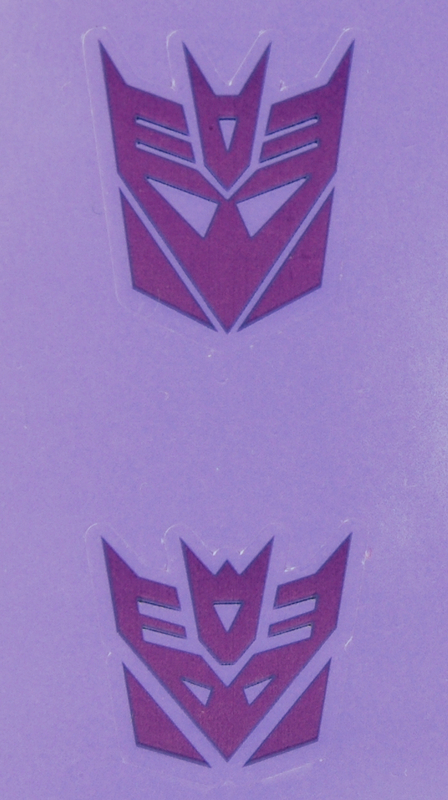 MP-29 comes with a sticker set with enough Decepticon symbols to actually do both at the same time and then adds two smaller symbols to his upper arms that display on either side of his alt mode. 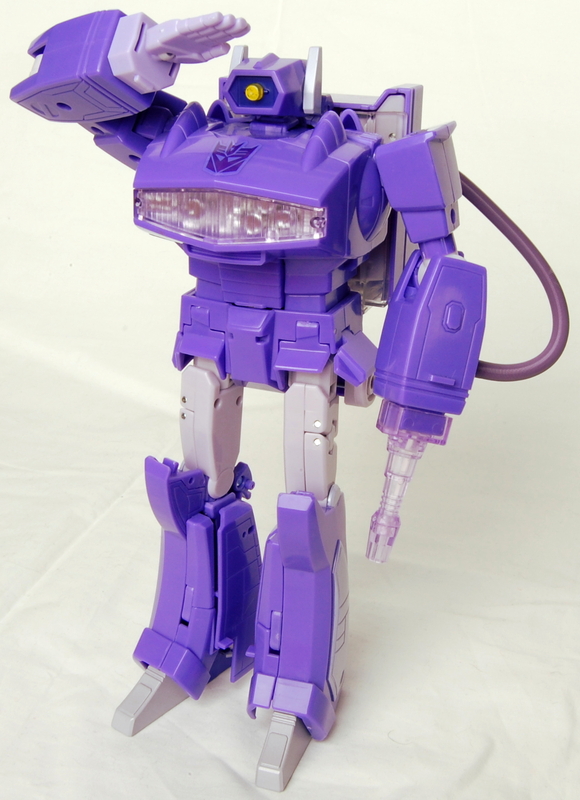 It then doubles down on the toy versus cartoon possibilities by providing both toy-centric and cartoon centric versions of the Decepticon symbols. 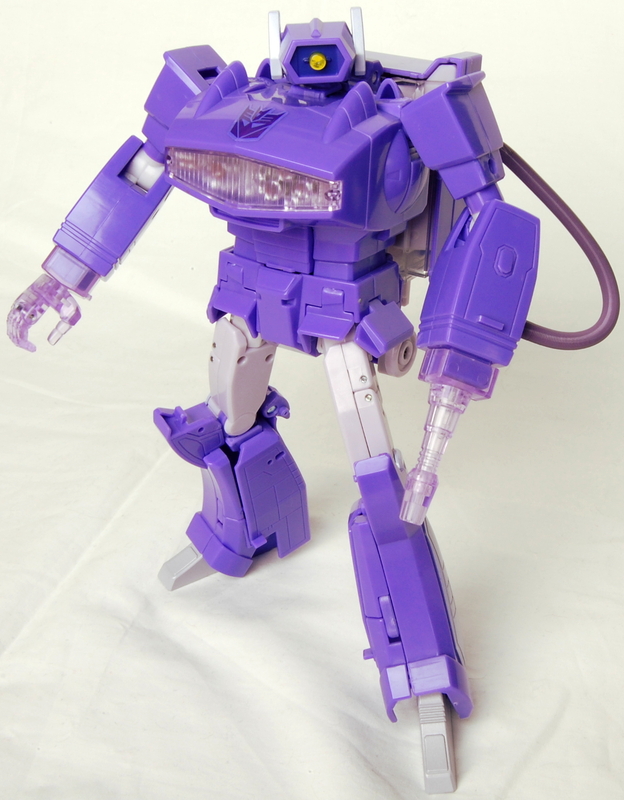 I am always toy-centric wherever possible and have chosen to go with a simple, clean single symbol on his chest with translucent hands. In at least one point though, toy-accuracy isn’t as easy to achieve. 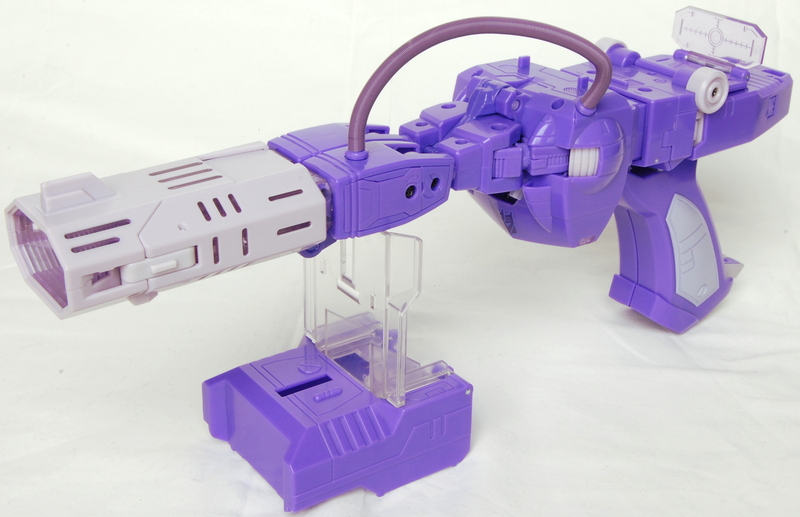 With his original toy, the piece that forms the end of his alt mode’s gun barrel is separate and can be set aside. In the cartoon, it folded down and turned into a purple backpack. 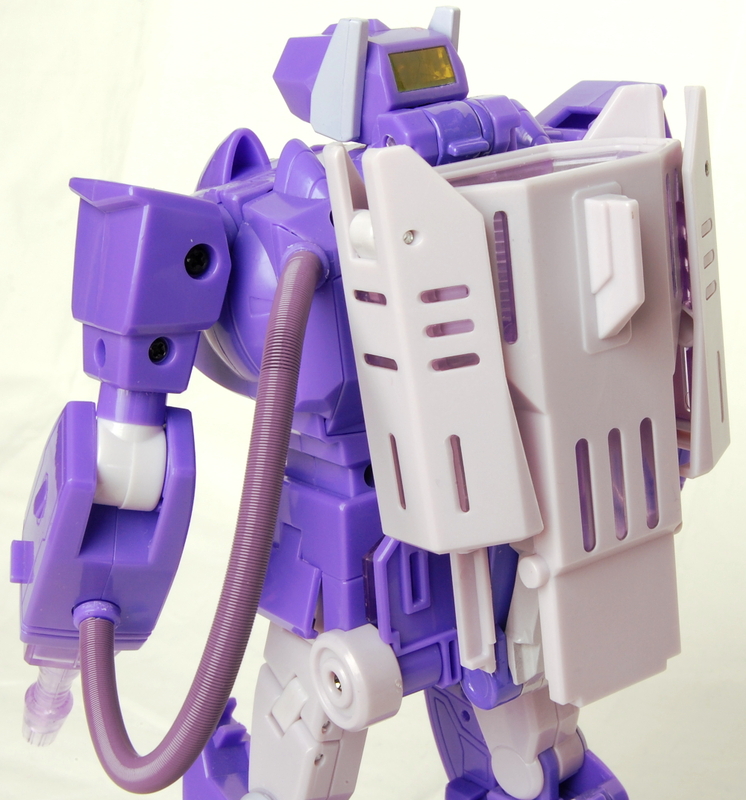 Rather than trying to figure out how to make this piece of plastic spontaneously change colours, they have included a shell piece to form his purple backpack over it. 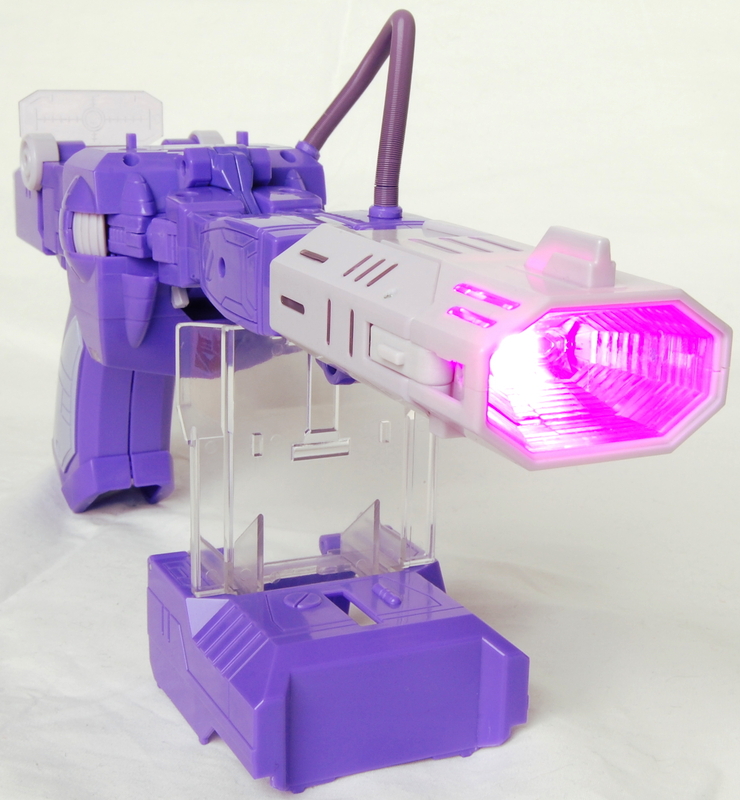 Speaking of his alt mode, the purple backpack piece forms a stand to display him as a laser gun. His alt mode is where the second set of electronics comes in. With the scale of the more recent Masterpieces, his gun mode is nicely human-hand sized though the trigger is hilariously small. Speaking of well-scaled alt modes as well as hilarity, the last accessory MP-29 comes with is a perfectly scaled miniature version of himself in gun mode. This is to help recreate more of those entertaining “confused G1 animator” moments. Oh, G1 cartoon, if nothing else, you can always be relied upon to provide some laughs. 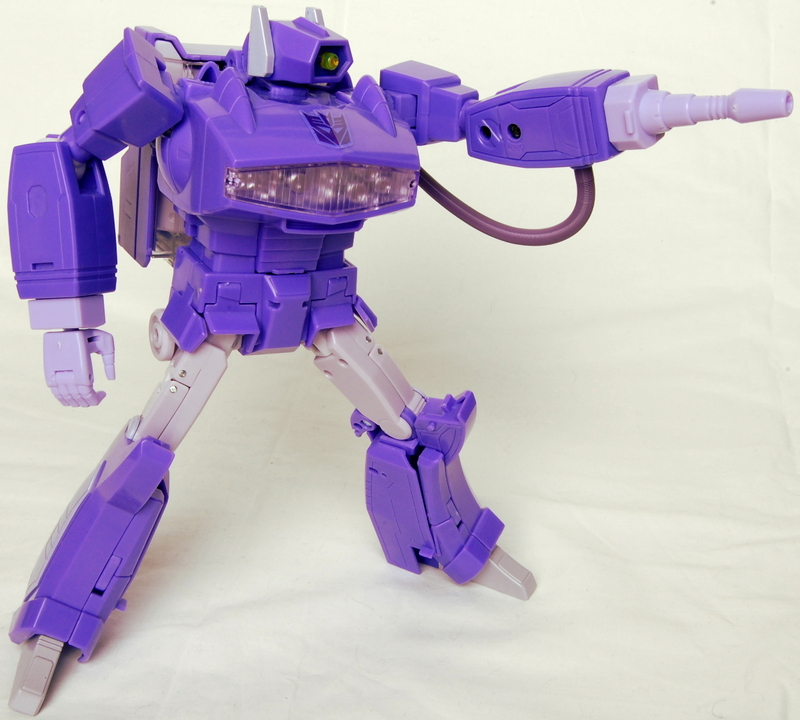 That aside, this is my ideal Shockwave. 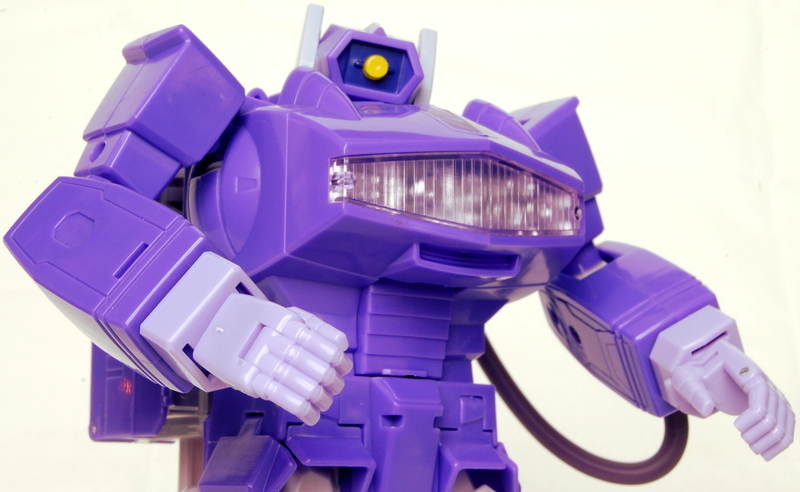 A perfect blend of cartoon accuracy and toy accuracy, it’s nothing short of a Masterpiece and overall centerpiece of the Shockwave display. You see, the name “Quakewave” for the third party one is accurate, as compared to this one, it looks like something that went through an earthquake. 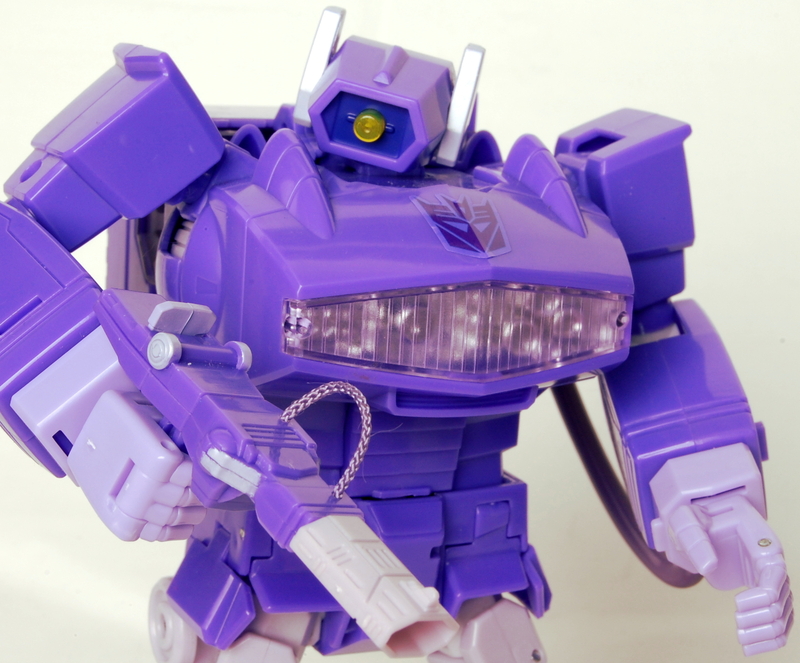 Shockwave generally look good in many version of the history of Transformers. His iconic look of just one eye is enough.